Anyone who reads this regularly will know that I love gnocchi – particularly when it’s in a lovely, warming, soupy dish. So this recipe should come as no surprise! Gnocchi is as versatile as pasta, in that it works extremely well with a huge range of different flavour combinations. Once you can make the sauce base for this recipe (which is easy as pie – just wine, water and creme fraiche) you can jazz it up with all sorts of flavours – you could add pesto and shredded chicken, you could swap the white wine for red wine and add sliced beef and mushrooms, use your imagination! This particular recipe is ready in 15 minutes flat and will serve 4. 1. Finely slice the prosciutto and put in a large saute pan over a medium heat. Allow to crisp up, then add the sliced spring onions and cook for 30 seconds. 2. Tip in the wine and water, bring to the boil and then add the gnocchi and peas. 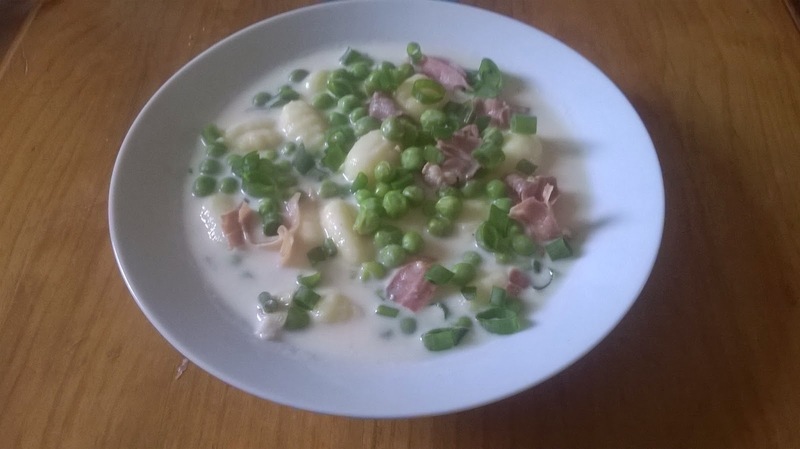 Simmer until the gnocchi is soft and the peas are cooked through. 3. Stir in the creme fraiche and lemon zest (about 1/4 of a lemon will be plenty), then bring back to the boil. Season with salt and pepper, and you’re done!